Stimulated by debates on public sociology in the recent years I studied contributions of sociologists in daily newspapers in Austria. Although sociologists are rather present in the Austrian press, I argue this remains without noticeable effects on public opinion formation; the topics sociologists write and talk about are rather arbitrary and they lack factual content. Although my data refers to sociologists in the Austrian press, the study’s conclusions might be true to the wider sociological community: Through such exposure, a public profile of sociology cannot evolve. 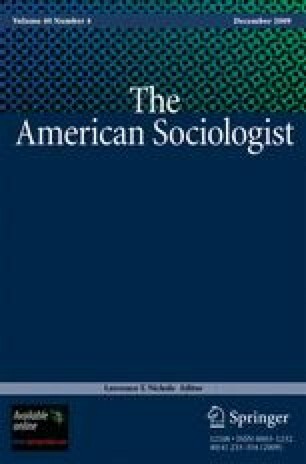 Furthermore, the article discusses criteria that prevent and complicate the relationship between sociologists and the press: avoidance of publicity, the problem of values and ideology, incompatibilities of language-games, divergence of relevance criteria, and deficient cultural empathy. Research underlying this paper was conducted while the author was in residence at the University of Graz, Austria. The project was initiated and funded by the “Oesterreichische Gesellschaft fuer Soziologie”—the Austrian Sociological Society. I would like to thank my colleagues for their useful comments and suggestions on earlier drafts of this paper: Christian Fleck, Christian Dayé, Werner Reichmann, and Stefan Laube. Croatian Bureau of Statistics. (2006). Statistical yearbook 2006. Zagreb: Republic of Croatia—Central Bureau of Statistics, Retrieved December 7th, 2007 (http://www.dzs.hr/Hrv_Eng/ljetopis/2006/28-Binder.pdf). EJC, European Journalism Centre. (2007). Media landscape—Romania. Maastricht: European Journalism Centre, Retrieved December 7th, 2007 (http://www.ejc.net/media_landscape/article/romania/). Gans, H. (2002). More of us should become public sociologists. Footnotes 30, Retrieved September 6th, 2007 (http://www.asanet.org/footnotes/julyaugust02/fn10.html). Kleinsteuber, H. J., & Thomass, B. (2006). Media landscape—Germany. 2006. Maastricht: European Journalism Centre, Retrieved December 7th, 2007 (http://www.ejc.net/media_landscape/article/germany/). Media Trend Journal. (2007). “Zeitungen.” Rueschlikon: Verlag Media-Daten AG, Retrieved December 6th, 2007 (http://www.mediatrend.ch/links/medien/zeitungen.html). NORDICOM. (2007). Comparative nordic media satistics—newspapers. 2007. Goeteborg: NORDICOM, Retrieved December 7th, 2007 (http://www.nordicom.gu.se/eng.php?portal=mt&main=nord_stats_translate.php&me=1). Školkay, A. (2005). Media landscape—Slovakia. 2005. Maastricht: European Journalism Centre, Retrieved December 7th, 2007 (http://www.ejc.net/media_landscape/article/slovakia). World Association of Newspapers. (2005). World’s 100 largest newspapers. 2005. Paris: World association of newspapers, Retrieved September 11th, 2007 (http://www.wan-press.org/article2825.html).